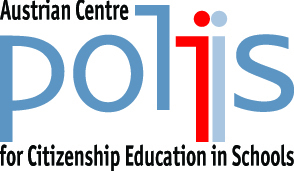 polis – The Austrian Centre for Citizenship Education in Schools supports teachers in putting citizenship education into practice. It works under contract to the Austrian Federal Ministry of Education/Department for Citizenship Education. The Centre provides teaching materials, acts as information and consultation platform, offers formation and continuing education for teachers, as well as workshops for students. Apart from knowledge transfer activities, the Centre also engages in awareness-raising and sensitisation for all issues concerning politics, democracy, human rights, consumer education and the strengthening of social skills. In 2017, the Council of Europe’s Reference Framework of Competencies for Democratic Culture (RFCDC) was adopted, followed by the launch of a Education Policy Advisers Network (EPAN) in 2018. Zentrum polis is member of the board of the Interessengemeinschaft Politische Bildung (IGPB). The first annual conference offers a diverse programme on the field of human rights education. Patricia Hladschik, of Zentrum polis, deals with the field of tension and the interaction of democracy and human rights with regard to education. She also presents the Council of Europe's campaign "Free to speak, safe to learn - democratic schools for all", which sees the school as an important player in democracy-building. In April 2017, the Council of Europe launched the European Policy Advisers Network (EPAN). The basis for the work of this network is the Council of Europe’s Reference Framework of Competencies for Democratic Culture (RFCDC). The Austrian experts to the EPAN network, Sigrid Steininger and Patricia Hladschik, invite to a roundtable presentation and discussion of this framework. For more information on the event please visit the German version. The largest german-speaking competition for citizenship education is aimed at school classes from the 4th to the 12th grade. The project proposals enable an intensive examination of current topics of citizenship education or topics relevant to human rights. Projects can be submitted until December 10, 2018. Generous prizes for the winners! The popular reference book celebrates its tenth birthday in September 2018. What were the most important milestones and achievements in recent years? The compilation on the polis-Website allows a small ramble through ten years of work with and for the policy encyclopedia. The National No Hate Speech Committee has elaborated recommendations how to combat online hate speech to the federal government and state governments. The No Hate Speech Committee, founded in June 2016, aims to raise awareness for online hate speech in Austria and supports the No Hate Speech Movement youth campaign initiated by the Council of Europe in 2013.